Villa Dioni is 120 m2, consists of two levels. The upper level occupied from the master bedroom has a double bed, its own en-suite bathroom and balcony with magical views across the sea and air-conditioning. The second bedroom offers two single beds that can be joint together to form a double and air-conditioning.,a main bathroom with bath/shower ,toilet,hairdryer, whilst the third bedroom has bunk beds and sleeps an additional two people and air-conditioning.. The lower level has an open plan kitchen ,dinning area and a sitting area with fireplace that leads to a fully furnished veranda. The Luxury villa Dioni offers a 32m2 private swimming pool of outstanding design and style (1m to 2 m max depth) with hydrolysis system, shower and sun loungers. Also provides a traditional stone built barbecue with a fully equipped kitchen, large table and chairs in order to enjoy unique, local delicacies. The tastefully furnished interior and exterior spaces, a parking for 1 to 2 cars. Alea Resort Villas, (Dion & Phedra) Private villa with pool and a magnificent view. Book now your vacation for SEPTEMBER & OCTOBER 2019 in a luxurious villa and earn a 5% discount for your early booking! Enjoy the summer 2019 in Alea Resort Villas! 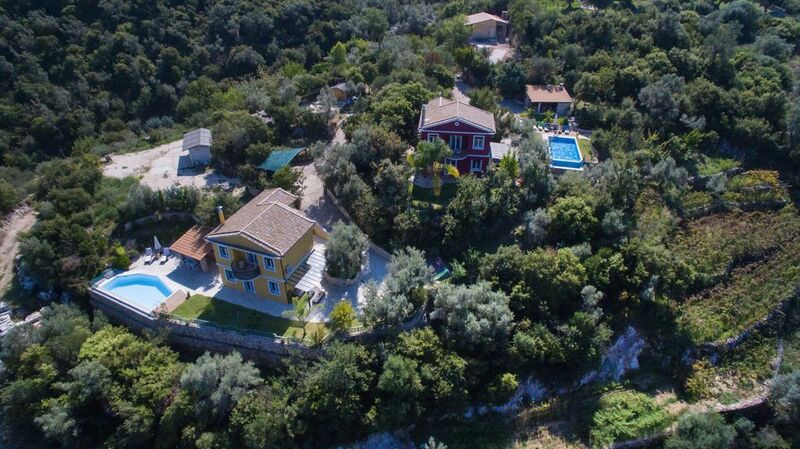 Your stay in Lefkada acquires a new dimension in the exquisite Alea Resort Villas (Dioni & Phedra), situated amongst 5.5 acres of dense vegetation,set up on the ‘Megali Vrisi’ hill in Lefkada, just 1km from the centre of town. They are ideal for sophisticated travellers who wish to spend their holiday in an environment of absolute tranquillity and privacy. These villas, with views over the Ionian sea, the town, across to Preveza and Lefkada channel, captivate the visitor with their magical colours from sunrise ‘til dawn and offer high quality services. With uninterrupted views of the emerald sea and set amongst beautifully flowering private gardens, this villa can accommodate up to 6-8 people and offers sunbathed verandas and sitting areas. Only a short drive away(2 min) is the town of Lefkada, with its traditional tavernas, shops, bars and nightlife, the marina and the famoust beaches of Agios Ioannis(kite surfing) and Kastro. Within 5-20 min drive one can reach the famous and exotic sandy beaches Kathisma -Pefkoulia -Port Katsiki of the west or east coast or to explore the diverse beauty of the inner of the island. These villas, with views over the Ionian sea,with uninterrupted views of the emerald sea and set amongst beautifully flowering private gardens only up on the hill ,one km from the city center.For us it's the best place to relax staring at the sunset into the sea while drinking coffee or a coctail at the surrounding area. Each villa with ultimate privacy has its one swimming pool (with hydrolysis system), barbeque area and its private parking. Bathroom with bath/shower ,toilet,hairdryer(upper floor) Bathroom with shower,hairdryer(upper floor) Bathroom with no shower(ground floor) Outside Pool Shower . Ground floor:The living room overlooking sun terrace and pool, furnished with fine, elegant pieces, sofas and a traditional fireplace.A dining table with antique chairs for 6. Satellite TV, CDs and DVDs .Telescope. One open plan designed kitchen with electric cooker with hobs, fridge/freezer, microwave, dishwasher, coffee peculator, kettle, toaster, work surface,cookery pots and utensils and glasses. The villa also offers a 32m2 private swimming pool of outstanding design and style (1m to 2m max depth) with hydrolysis system, shower and sun loungers. Notes on accommodation: A small biological vegetable orchard in which fresh tomatoes, peppers etc are planted. Beautiful ponies,deer and wild goats can be seen in a restricted highly secured area . Cleaning / Towels / Linen / Maid service: Linen and towels provided (including pool towels). House cleaning and pool maintenance twice a week (usually Wednesdays, Saturdays or Sundays)swimming pool maintenance. Thank you for sharing your feedback regarding your stay! Also, thank you for the kind words regarding the villa. We are continually trying to improve the variety and quality of services that we offer. Thank you for staying and we hope that you will consider us for your next trip! A great host, a magnificent property, unique view! This is a wonderful property, very nicely designed with a cosy atmosphere and a unique attention to details. The house is well proportioned with many great small details that makes it so welcoming. The outdoor area is just beautiful and very functional. It will give you the feeling of living in a luxury boutique property. Maria is a great host with such a positive spirit. We felt there like in our own home, many days we didn't even feel like going to the beach, the property was enough for a great day with the family. Dear Mihai, I would like to thank you for your kind comments! We tried to do the best that we could for you ! Hope to see you and your family in the future! Best wishes. Idyllic place for a fabulous stay. We spent 14 wonderful days at Villa Dioni. The villa is very comfortable, spacious, clean (the cleaning done twice a week) and well equipped. Its location on a hill overlooking the town of Lefkada, is superb. The infinity pool with views is a delight. The garden is very nice and perfectly maintained. The decoration of the whole realized with taste and full of small details helps to make this place a really special. Maria and Georgios are extremely charming and friendly. They are attentive to the welfare of their tenants and are always there if you need them. We thank them for their warm welcome. Nous avons passé 14 jours formidables à la Villa Dioni. La villa est très confortable, spacieuse, propre (le nettoyage fait 2 fois par semaine) et bien équipée. Son emplacement sur une colline surplombant la ville de Lefkada, est superbe. La piscine à débordement avec vue est un délice. Le jardin est très joli et parfaitement entretenu. La décoration de l’ensemble réalisée avec gout et plein de petits détails contribue à faire de cet endroit un lieu vraiment spécial. Pour couronner le tout, Maria et Georgios sont extrêmement charmants et chaleureux. Ils sont attentifs au bien être de leurs locataires et sont toujours là si vous en avez besoin. Nous les remercions pour leur accueil chaleureux. Bref, je recommande vivement cet endroit idyllique pour un séjour fabuleux. I would like to thank you for your kind comments! We tried to do the best that we could for you ! Hope to see you and your family in the future! Wir waren für 10 Tage in der Villa Phedra und sind absolut begeistert. Fangen wir mit der Ankunft an - die Anfahrt ab Flughafen Preveza dauert ca. 20 Minuten - die Lage Lefkada Town ist perfekt. 1 km und du bist in der Stadt oder am Strand. Einkaufsmöglichkeiten, Strände , alles hier und sehr nah. I and my daughters spent our holiday in villa Dioni. We had a wonderful time- the villa is amazing and offers everithing you need. I was impressed over little details in and around the house. The swimming pool was clean and verry well maintained. I was also impressed over the outside kitchen where you have a beautiful view on Lefkas city.The outside kitchen is very well equipped. Maria and her family are extremly nice people. They take great care to make their guests feel at home and they were always there if you need them.Nothing is too much trouble for them. No doubt- we definitely will recommennd Villa Dioni for peaceful and luxury stay. I would like to thank you for your kind comments! We tried to do the best that we could for you ! Hope to see you and your daughters in the future! Best wishes. I stayed at Villa Dioni in Aug 16 with a group of friends. We had a fabulous time - the villa is a good size, the grounds are beautiful, the pool is awesome, the indoor & outdoor kitchen setup super convenient. I loved the attention to little quirky details throughout- this is not a standard cookie-cutter holiday rental. The house felt like a home, and our hosts were lovely - they even provided some delicious fruits and vegetables from their garden. The two villas are located on the same grounds but totally private and separated from each other by lush vegetation. Very close to the city, so easy to nip in and out for any groceries and also convenient for nights out with a short drive back. I would highly recommend Villa Dioni! I would like to thank you for your kind comments! We tried to do the best that we could for you ! Hope to see you and your friends in the future! In the summer,the visitor can enoy watersports like windsurfing or kitesurf as the island is famous for its windy spots. Cycling in town and around the lagoon as another sportive option is available, yoga course and reiki massage at the house for relaxation and wellness is provided. You could visit the picturesque mountainous villages or take part in day tours in the islands of Meganissi, Scorpios. A lot of cultural events, theatre, dance, exhibitions: Speech and Word Art festival in July and August, and International Folklore festival on the 3rd week of August are famous 50 years old local institutions.Also remarkable archaeological and folkloric museums can be visited. for windsurf or kitesurf and Kastro beach. Milos beach: world famous kite-surf beach, 1km. Kathisma beach: white sandy beach, beach bars, 20km. Porto Katsiki beach: spectacular white sandy beach, 35km. Vassiliky beach: wind surfing and hobby cats, 38km. International Airport of Aktio-Preveza 20km from the villa. Athens International Airport 420km.Airport of Ioannina 145km. Igoymenitsa is the nearest port 150km. Buses 5 or 6 a day (five hours journey)for Athens to lefkada. From the main town 0,5km which have all you need.The nearest supermarket is 400m. Booking Notes Rates in Euros per week per villa (6 persons per villa). For extra persons (more than 6) a small extra amount may be charged depending on the period. Do not hesitate to contact us for better prices and special offers, especially during the off-season. All taxes and services are included in price.